Molly Brunson, Russian Realisms: Literature and Painting, 1840-1890. Russian Realisms: Literature and Painting, 1840-1890 by Molly Brunson (NIU Press, 2016) is a brilliant achievement in the field of interdisciplinary studies of culture. In this original and illuminating monograph, Brunson reevaluates a familiar literary term and presents the conception of realism that transcends disciplines. In a series of original interpretations of individual works by Repin and Perov, Dostoevsky and Tolstoy, Brunson analyses the fruitful engagement of painting and literature with each other and with contemporary debates on aesthetics and captures the many versions of realism. While the great Russian novel has long been part of the Western literary canon, Brunson is the first to integrate the lesser-known Russian realist painting into a broader trajectory of realism. Brunson argues that it was the “audacity of realism”—its self-consciousness and optimistic failure—that created the national tradition of Russian painting and the unique Russian novel. The significance of this discovery extends beyond Russian realist literature or art. No less significant is the inspiration that this volume offers to the next generation of scholars, art historians and literary scholars alike. 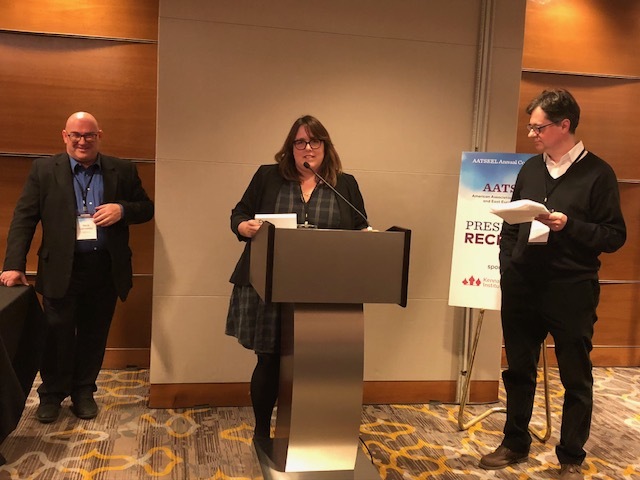 Molly Bronson accepting the Prize for the Best Book in Literary Criticism from Mark Lipovetsky (President of AATSEEL) and Ilya Vinitsky (Head of the Publication Committee). Emily Van Buskirk, Lydia Ginzburg’s Prose: Reality in Search of Literature. Lydia Ginzburg's Prose: Reality in Search of Literature (Princeton UP, 2016) by Emily Van Buskirk is a remarkable book, both for the depth of its insights into the writing of one of the twentieth century’s most thoughtful witnesses and critics, and for the understated originality of its own approach to scholarly writing about reality and literature. Drawing on her pioneering archival research, Van Buskirk carefully reconstructs the mechanisms of self-writing in Ginsburg’s extensive fragmentary prose, in the process shedding light on what she incisively identifies as the Soviet intelligentsia’s “post-individualist self.” Even as she follows her protagonist everywhere and queries the narratives of Soviet experience, Van Buskirk also thinks sensitively and critically about the universal experiences of love, suffering, and aging. Subtly combining history, biography, and literary analysis, Van Buskirk’s book is a model of ground-breaking and rigorous scholarship to be studied and emulated. Polina Barskova, Ilya Kukulin, Ben Felker-Quinn, Eugene Ostashevsky, Matvei Yankelevich, Jason Wagner, Rebekah Smith, Anand Dibble, Ainsley Morse, Charles Swank, Written in the Dark: Five Poets in the Siege of Leningrad. 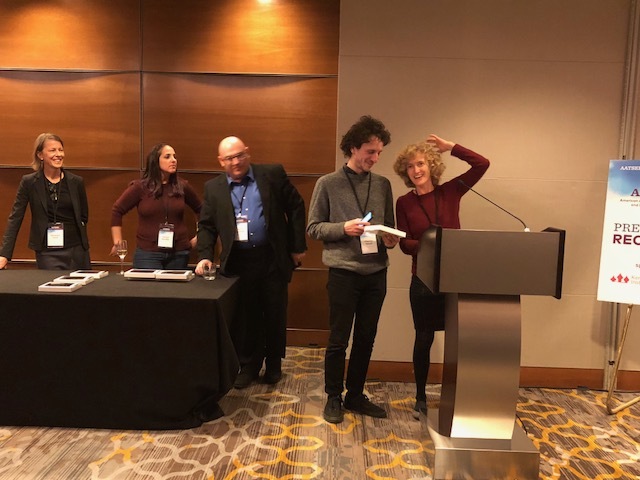 This year’s AATSEEL Prize for best literary translation into English goes to Written in the Dark: Five Poets in the Siege of Leningrad, published by Ugly Duckling Presse, a feat of collaborative translation (edited and with introduction by Polina Barskova and with Afterword by Ilya Kukulin). The five poets—Gennady Gor, Dmitry Maksimov, Sergey Rudakov, Vladimir Sterligov and Pavel Zaltsman—deftly translated here—were mainly artists and intellectuals propelled to poetry through the intensity of the experience of living through the winter of 1941-1942, the long unforgiving first winter of the Nazi Siege of Leningrad (1941-1944), where hundreds of thousands starved or froze to death. By the end of that first winter, roughly 500,000 people had died. These five poets wrote most of the works contained in the anthology either during this horrid period or shortly thereafter. These poems are thus not only about the siege, but of the siege. Written in the Dark, a carefully curated anthology, is an achievement of eight translators and testifies to the advantage that collaborative translation brings. Originating in Polina Barskova’s 2013 translation seminar at Hampshire College, the translation project grew into an anthology, and as it grew, drew others into it, including editors and seasoned translators. The poetry of Gennady Gor, translated by the team of Ben Felker Quinn, Eugene Ostashevsky, and Matvei Yankelevich, is the crown jewel of the volume. Gor, heir to the experimental OBERIU poets, presents a challenge due to the poetics he crafts to carry the horror of life under siege. Rhythmically scrupulous and sonically resourceful, the translations of Gor’s fifteen poems jar in their cruel immediacy. Jason Wagner, Rebekah Smith and Matvei Yankelevich translated the poetry of Dmitry Maksimov, by turns physical and metaphysical, with deft diction and an uncompromising starkness. In their translations of the poems of Sergey Rudakov, Anand Dibble, and Matvei Yankelevich find something in translation, releasing his verse from the constraints of at times mundane rhyme, and finding thereby a rhythm that works. Ainsley Morse has risen to the challenge of translating Vladimir Sterligov, primarily a painter, whose ekphrastic poems evoke both language and image, no small task for the translator. The poetry of Pavel Zaltsman, visual artist, painter, novelist, filmmaker and diarist, is translated with brutal directness by Charles Swank and Matvei Yankelevich. One of the highlights of the volume is their lovely rendition of the bittersweet “Dinnertime Ode to Chub.” Zaltsman’s Diaries, provided in short fragments as an appendix to the notes on the poet and translated by Ben Felker-Quinn, deserve to be mentioned for their force. Framed by paratext, including Polina Barskova’s context-setting introduction, an afterword by Ilya Kukulin, and notes to the poems, this anthology, while the work of many hands, hangs together as a whole. 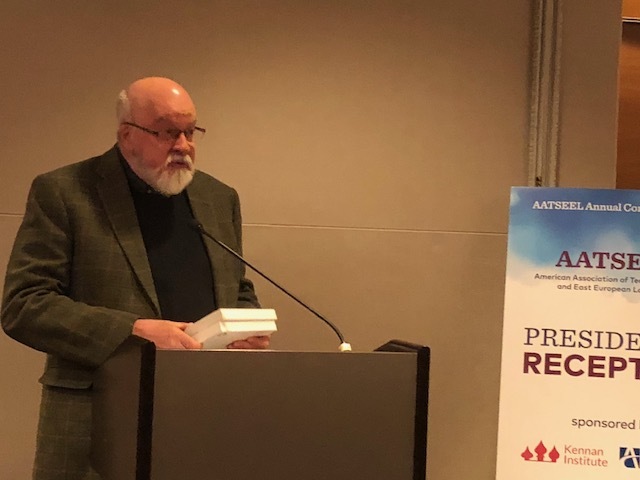 A triumphant testament to the productive potential of the translation workshop, and a volume casting new light on a dark period in world history, Written in the Dark is a fitting recipient of this year’s AATSEEL Prize for Best Literary Translation into English. Ainsley Morse and Charles Swank accepting the Prize for the Best Literary Translation. Nikita Lary and Jay Leyda, The Alexander Medvedkin Reader. 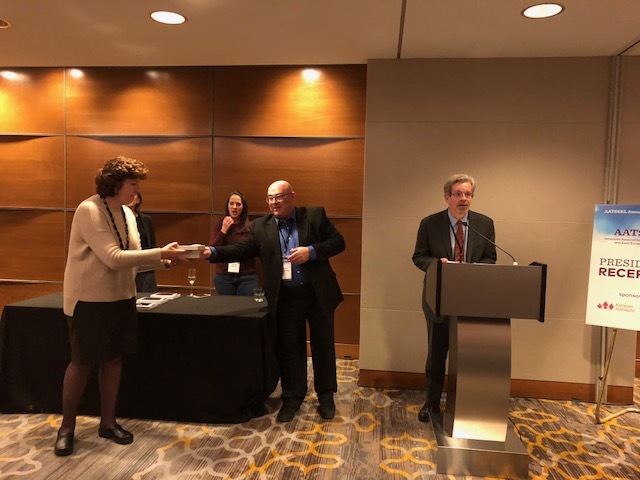 This year’s AATSEEL Prize for best scholarly translation into English goes to The Alexander Medvedkin Reader, published by the University of Chicago Press, a product of joint editorial efforts of Medvedkin himself, Jay Leyda, and Nikita Lary, and translated by Leyda and Lary. Several decades in the making, this well-translated, expertly compiled and comprehensive volume shines a light on the legacy of Aleksandr Medvedkin (1900–1989), one of the last strikingly original, innovative talents of early Soviet cinema to emerge before the wholesale imposition of socialist realism in the mid-1930s. In 1931-32, he organized and led a “film train,” an experimental documentary filmmaking project that crisscrossed the country and documented its transformation (Chapter Two of the Reader contains a section on the Kino-Train). Jay Leyda, who translated the section detailing the Kino-Train Filmography (Chapter Twenty-Six), provides us direct access to Medvedkin’s radical exercise. Readers and scholars will encounter here a mother lode of source material for research on Medvedkin, an innovator of satirical filmmaking unrivaled in Soviet film at the time, who gave us the 1934 grotesque comedy Happiness, one of the last works of silent film released in the USSR. Praised by Eisenstein and compared by him in its originality to the innovativeness of Chaplin, it was suppressed from wide release and was only rediscovered by Western filmmakers in the 1960s. Medvedkin’s1938 film The New Moscow was likewise banned by the authorities, and most of his later work fell well within the mainstream of Soviet documentary filmmaking. ​Medvedkin’s ideas became influential in innovative French filmmaking; however, his work was still relatively unknown in the English-speaking world. The French filmmaker Chris Marker, whose epistolary exchange with the filmmaker is included in the book, worked on a documentary about Medvedkin titled The Last Bolshevik, eventually released in 1992. Jay Leyda, a student of Eisenstein in the 1930s and a pioneering US film historian, began assembling, with Medvedkin’s participation, a volume of his selected writings, which became Leyda’s last major project. In 1984, he invited Nikita Lary to join the volume’s editorial team and to take over as the principal translator. The volume took shape in the heady and exciting years of perestroika, but its progress was interrupted by the passing away of Leyda, and shortly thereafter, of Medvedkin himself. We are fortunate that Professor Lary, who also provides an informative preface, was able to return to the project, adjust to the increased availability of Medvedkin’s films, and see the project successfully to publication. The volume brings together a selection of Medvedkin’s original scripts, along with memoirs of his early film work, a selection of his later theoretical writings that return to the question of satire, as well as responses to his work, among others by Eisenstein and Marker, as well as by contemporary scholars, and a portfolio of biographical and other documents, supported by thoughtful, well-organized endnotes. The resulting book is a multifaceted portrait of a passionate innovator, his desperate struggle to sustain originality, and his survival to see his work appreciated by global peers. The translations are lucid and readable, ably conveying the tone and style of the original. The publication of The Alexander Medvedkin Reader fills a major lacuna in our understanding of early Soviet cinema, and is a gift whose value to the global community of film scholars and film enthusiasts is hard to overestimate. Nikita Lary accepting the Prize for the Best Scholarly Translation. Lynn DeBenedette, William J. Comer, Alla Smyslova, and Jonathan Perkins, Между нами. The AATSEEL Prize for Best Contribution to Pedagogy goes to Между нами. Elementary-level Russian textbook by Comer, William J.; DeBenedette, Lynn; Smyslova, Alla; Perkins, Jonathan. The Pedagogy prize committee determined that Mezhdu nami deserves this award for many reasons. Mezhdu nami is a fully online, open-access comprehensive beginning Russian-language course. All online components are available freely, and even printed versions of Classroom Activities and Homework Assignments are sold for a minimal cost. Mezhdu nami features a wealth of resources for teachers, including sample lesson plans, suggested schedules, a test bank, PowerPoint presentations, and transcripts of audio assignments. Mezhdu nami contains clearly defined linguistic, pragmatic and cultural goals and a clear lesson structure. It provides an abundance of auditory input that is easy to engage; all of which is accessible with one click, no downloads required. Mezhdu nami takes important steps forward with inclusivity and representing the diversity of people who study and speak Russian. It introduces residents of Russia and students of Russian of different ethnic and cultural backgrounds. The textbook introduces students to major places in Russia where our students are likely to go if they study abroad, including Moscow, Saint Petersburg, Yaroslavl’, Irkutsk, and Kazan’. This textbook is heavily grounded in Second Language Acquisition theory, particularly Input Processing theory and contemporary language methodology, mostly the task-based approach. It is easily adaptable for use in flipped classrooms and any hybrid learning environments. Alla Smyslova and Bill Comer accepting the Prize for the Best Work in Pedagogy. Andrii Danylenko, From the Bible to Shakespeare: Pantelejmon Kuliš (1819–97) and the Formation of Literary Ukrainian. Andrii Danylenko’s From the Bible to Shakespeare: Pantelejmon Kuliš (1819–97) and the Formation of Literary Ukrainian (Boston, MA: Academic Studies Press, 2016) demonstrates the complex history of the Ukrainian language, not only on the level of the history of Ukrainian, but also on the level of Pantelejmon Kuliš, the focus of this book. The author follows the transformation of Kuliš’s vision of literary standard Ukrainian: from resisting both Polish and Russian influences to ultimately synthesizing the language varieties from Galicia on the one hand and the Old Rusian [sic] (which subsequently facilitated the development of Russian) on the other, while upholding the Ukrainian vernacular. In comparison to Ševčenko who championed the language of the peasantry, Kuliš, in the process of his translation (especially Shakespeare), developed contextualized uses of bookish and Church Slavonic forms as well as Galician forms and western European terms imported through Polish. The book thus illuminates a distinct path taken by Kuliš: a synthetic approach, in contrast to typical attempts to maximally separate a language from the others, which one often encounters in sociolinguistic descriptions. “Rejected on both banks of the Dnieper River, Kuliš was a true unifier of the two parts of Ukraine” (385). The book draws on extensive philological sources, both primary and secondary. It is thought-provoking and is accessible to readers of literary studies (especially translation studies), linguistics, and the general public. It is highly relevant to sociolinguists who deal with language and identity in all its complexity.